What is the OvuFriend Ovulation Calendar? The OvuFriend Ovulation Calendar is an easy-to-use tool that will allow you to follow your fertility and that will increase your chances of conception. It was created especially for women trying to conceive. It is not an ordinary calculator of your fertile days, nor is it the well-known calendar of fertile days! When estimating your fertile days and your ovulation dates, OvuFriend takes into account the fact that every woman is different. OvuFriend peruses your own knowledge about your body and, employing the processing power of the computer and advanced statistics, helps you maximize your chances of conception! How will OvuFriend determine my fertile days and the time of my ovulation? When registering with OvuFriend, you will be asked to provide basic information about your menstrual cycle, as well as to make a few very basic observations or tests on a daily basis. 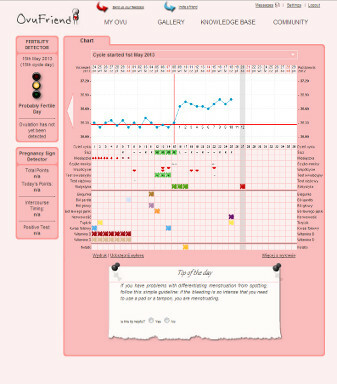 Meanwhile, OvuFriend will be learning about your fertility and interpreting your inputs in real time. The system will inform you when your fertile days arrive, and will also pinpoint the time of your ovulation on your chart. The more information you fill in daily, the more accurately OvuFriend will be able to determine your fertile days and your ovulation. Why is registering with OvuFriend worthwhile? Each and every day, OvuFriend will tell you what more you could be doing to increase your chances of conception! Why is OvuFriend so effective? The effectiveness of OvuFriend hinges on the combination of your knowledge of your own body and the use of the processing power of the computer, which are tied together using an innovative algorithm. It analyzes the information that you fill in daily, and then compares it with the cycles of thousands of other women who are also trying to conceive, in order to come back to you with specific dates on which the likelihood of your getting pregnant is by far the highest.